Over time your garage door panels can become damaged by vehicles, people and even pets. Simple damage, such as a scratch or small dent, is relatively easy to repair. How you go about repairing this damage though, will depend on the composition of your door. For instance, a small dent to a wooden door can be easily fixed with filler. However, larger areas of damage may need the attention of a skilled professional. Aluminum doors are the simplest to repair and can be fixed by heating a piece of tin foil over the surface of the dent. As the temperature changes, it will restore the material to its initial flat surface. Dents on steel doors, on the other hand, should be sanded down, filled with an auto-body compound, and re-painted. Whatever type of touch-up needed, remember to thoroughly wash the door with soapy water and let it dry before you begin. 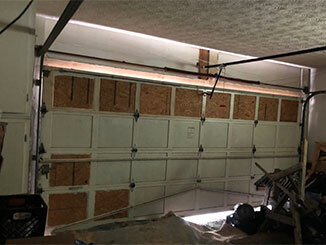 For large areas of damage, you'll need to call in a skilled garage door professional. They will inspect the damage and let you know if the panels can be repaired or if they will need to be replaced. In some cases, it may be possible to replace one or more of the panels. Usually, the original manufacturer can be contacted directly, meaning our local team can help you find the perfect color match and style. With older model doors, the color may have slightly faded, and the replacement panel may be slightly different. In which case, it may be preferable to repaint rather than pay for a complete replacement. In the event of two or more panels being damaged, our team will advise you if a panel replacement is a viable option. Often, the cost of replacing a few panels may be higher than the installation of a new door. If the damage to the door was caused by a reversing car, the force of the impact may even have compromised the opener's components. In this case, our technicians at Garage Door Repair Millcreek, UT will visit your property, inspect the door and provide the best way forward.